The weather broke the day we left Pompei and the heavens opened. We weren’t going far, just 20km along the coast but away from the run down urban edge that surrounds Pompei. 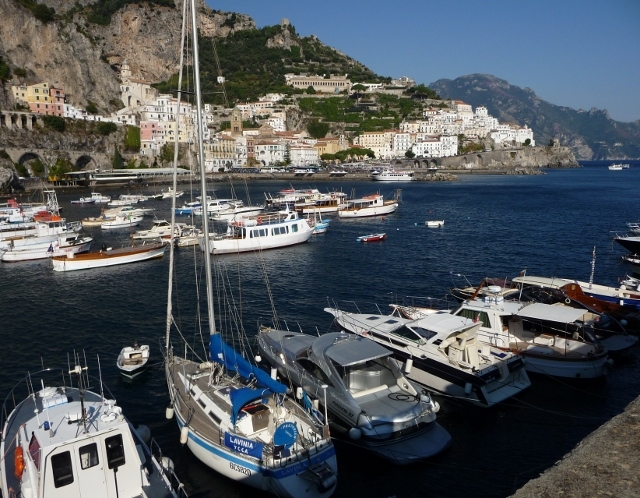 Having stocked up at the nearby supermarket, we headed towards Vico Equense to a small campsite by a marina, to sit out the weather in the hope that it would improve for us to drive the famous Amalfi coast the next day. The site felt a bit dark and dingy with heavy skies and olive and walnut trees casting plenty of shade. The olive trees were in the throws of being trimmed and branches were piled up everywhere. The ground was smattered with the walnuts about to be gathered in. Both activities halted by the weather. We looked forward to the rest of the day cooped up in the van, catching up on blogging and maybe watching a dvd. As it turned out, we spotted that our Dutch neighbours from the Pompei campsite were here too and although we’d only exchanged greetings at Pompei, I got chatting with Marleen in the loos and they invited us into their large cosy campervan for some wine. Maikko and Marleen have also been on a long career break trip around Europe and as we swapped stories and experiences, wine turned into dinner and more wine, and the rain was forgotten. They had parked under a walnut tree though, and gusts of wind brought the alarming thundery thud of walnuts down on their roof at regular intervals – we wonder just how dented the roof is now. Luckily, the next day dawned fine and we said our goodbyes to our new friends and took the road through the seaside resort of Sorrento. Then west towards the Punta Campanella at one end of Sorrento’s peninsula. We saw a sign for a panoramic view and set off on foot expecting it only to be a couple of hundred metres away. 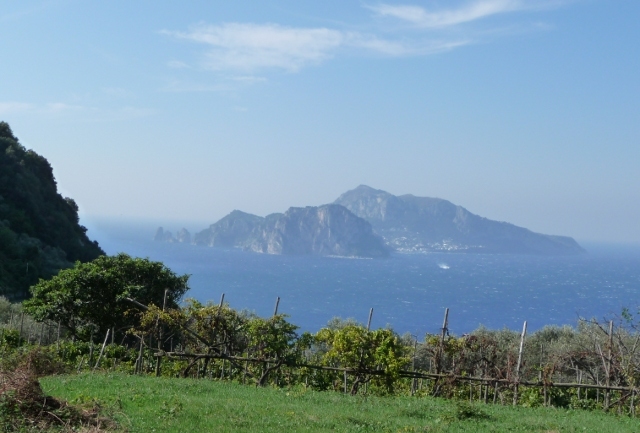 Two hours later and we’d had a good leg stretch up and down hill along the coast right to the tip with spectacular views of Capri. 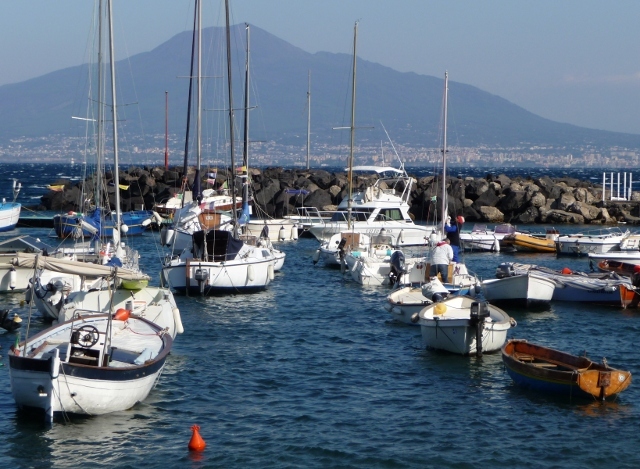 We then drove along the ridge above Sorrento with views across the sweep of the Bay of Naples to the city and Vesuvius, and round the next corner we could see the sea on the other side and the start of the Amalfi coastline proper. It is one of the world’s most spectacular drives, but the traffic was crazy. Luckily it wasn’t as busy as it could have been, as we saw plenty of near-misses. The road wasn’t as scary, precarious or as narrow as we thought it might be. Steep cliffs rise high above and towns climb up at all angles. On this first afternoon, we got as far as Amalfi, but felt we wouldn’t do the route justice in just half a day. We had a wander around the town – very picturesque and suitably touristy. Judging by the bodyguard types around, one of the many celebrities that flock here must have been in town. We drove back along the road westwards again to find a campsite near Massa Lubrense. A quiet place with a sea view beneath an ancient tower. The coastline was tremendous in the morning light and we had a leisurely Sunday drive, stopping to take pictures here and there. 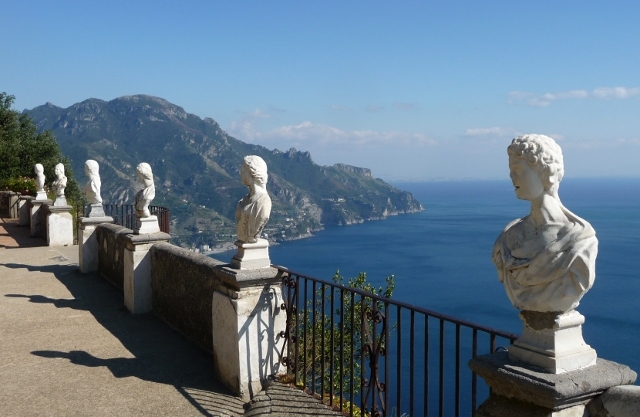 We turned off after Amalfi and took a hairpinned traffic lighted route up the mountain to Ravello. A charming town with many vistas of the coast, we enjoyed exploring the narrow passage ways. We felt rather underdressed. It was sunny but with a chill breeze and you could pick out foreigners, especially the Brits, a mile off. We were the ones still in light summer clothing, while we saw Italians in heavy winter coats, woolly hats and scarves. If it gets any colder, they really won’t feel the benefit. At the end of one passage way we came to Villa Cimbrone, which was a rundown estate when discovered by William Ernest Beckett, Lord Grimthorpe, in 1904. A grand tourist connected with the Bloomsbury set, Beckett brought it back to life and created English style gardens on this Italian hilltop. English gardens don’t tend to have much in the way of colour in October, but the high infinity terrace lined with statuary was heavenly, and it was what we spotted when we leant over the railing that really made our day complete. 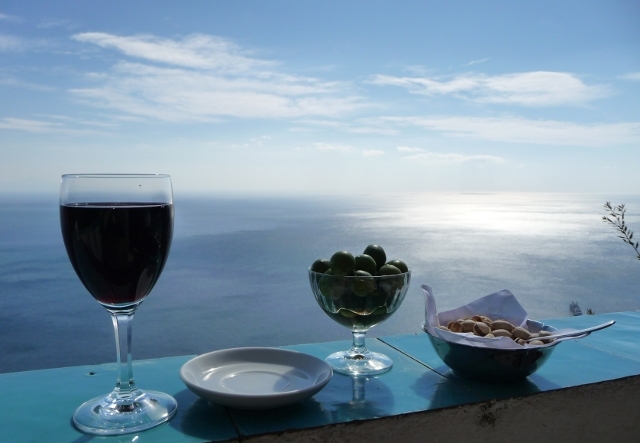 We saw a small tiled balcony just below us with a couple of glasses and a bowl of nibbles on the ledge. There was somehow a bar below us. We immediately sniffed it out – most of the tables were on the lawn, but we found the balcony and it had just been vacated. This had to be the most perfect spot for a drink in Europe, if not the world, and we had it all to ourselves. Two large glasses of wine and huge bowls of olives and nuts and we were in paradise. It was a sun trap too and we basked as we drank in the wine and one of the best views ever. This wonderful Sunday interlude makes its way well into the top ten highlights of the trip so far. We did eventually drag ourselves away so that someone else could have a turn and returned to the coast road once more. 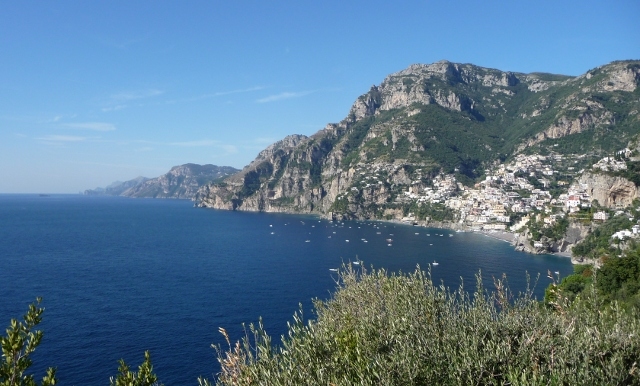 The drama of the Amalfi coast peters out as you near the port city of Salerno, and the landscape south of the city is flat, scruffy and uninspiring, but it would have a tough act to follow.